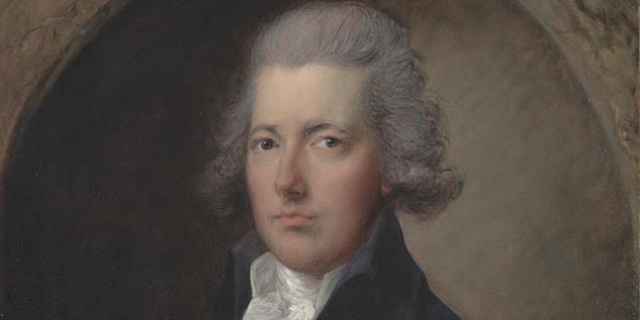 William Pitt (the younger) was born on 28 May 1759 at Hayes Place, Kent, the second son of William Pitt (the elder), later 1st Earl of Chatham and himself Prime Minister. He matriculated at Pembroke College, Cambridge at the age of 14, and later proceeded to Lincoln’s Inn to study law. Unable to afford the expense of standing for Parliament (his finances remained a source of insecurity throughout his life), he was only able to embark on a political career through the influence of Sir James Lowther, who secured his election as MP for Appleby in 1781. In 1782 he was appointed Chancellor of the Exchequer (then a relatively minor post) in Lord Shelburne’s administration. When, in December 1783, George III dismissed the Fox-North ministry that had succeeded Shelburne’s government, it was to the 24-year-old Pitt that the king turned to serve as both Prime Minister and Chancellor, endorsed by the outcome of a general election held early in 1784, which belied opponents’ characterisations of the youthful premier as a royal puppet. The election also buttressed Pitt’s preferred stance as an independent politician by freeing him from association with Lowther: Pitt won the University of Cambridge’s seat in the House of Commons. If Pitt’s political fortunes would be determined in part by the impact of events such as the French Revolution and Wars, and George III’s mental illness (the Regency Crisis of 1788-9 threatened to favour the Prince of Wales’ political associates at Pitt’s expense), his early years as premier evidenced a determined commitment to reform of the British state. He offered in some ways a new ‘reformist’ model of active, pragmatic prime ministerial leadership followed by many of the most significant political figures of the next half century of varying party allegiances (fittingly, since although often described posthumously as a Tory, Pitt would have understood himself as within a Whig tradition). Many of his initiatives stalled or were only partial successes. An attempt at limited parliamentary reform was abandoned after a parliamentary defeat in 1785; he addressed the British governing relationship with both India and Ireland with mixed results. It was partly at Pitt’s prompting that William Wilberforce took up the issue of the slave trade. Among his most striking initiatives were financial and administrative reforms with an eye to efficiency and the elimination of corrupt practices, and a serious attempt to reduce the national debt through the creation of a sinking fund in 1786. The second half of Pitt’s ministry, however, was dominated by the consequences of the French Revolution and the outbreak of war with France in 1793, after he expelled the French ambassador following the execution of Louis XVI. Although claims of a Pittite ‘reign of terror’ in response to domestic radicalism were exaggerations, Pitt offered a clear and unequivocal defence of the established order to those who rallied to him during the 1790s. This included a substantial section of the Whig party led by the Duke of Portland, leaving only a rump in opposition led by Pitt’s long-time opponent, Charles James Fox. The wartime situation made it more difficult for Pitt to pursue his administrative reforms and also made significant financial retrenchment impossible: Pitt was forced into a series of expedients to raise the vast sums necessary to sustain the war effort, including in 1799 Britain's first income tax. The international context also made a resolution of Irish issues more pressing. Following the rebellion of 1798,arose the Act of Union of 1800, a major triumph for Pitt, which saw the United Kingdom of Britain and Ireland come into being on 1 January 1801. Pitt believed the Act of Union required as a corollary the admission of Catholics to Parliament, but found himself opposed both by Cabinet colleagues and more importantly the King, who saw this as incompatible with his coronation oath. The impasse led to Pitt’s stepping down as Prime Minister on 14 March 1801. He was Britain's youngest ever Prime Minister, entering office at the age of 24. He fought a duel 27 May 1798 on Putney Heath against George Tierney, a Foxite MP. Pitt wrote to his mother; “….The business concluded without anything unpleasant to either Party”. He introduced the first Income Tax in Britain in 1799. Any info on Signal and Martello built under the Pitt government on the county cork coast to protect ireland from a french landing please? These were built 1804 and all 80 and 50 respectively were completed by 1806. Colette, your project sounds great. I suggest that you make an email enquiry to The National Archives via our contact form - please go to http://www.nationalarchives.gov.uk/contact and chose the Records and Research enquiry form. We are happy to give guidance and advice about record sources, though (as no doubt you realise) we are unable to conduct research free of charge.